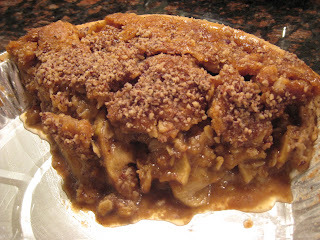 One of the main desserts my family always requests that I make over the holidays is my caramel apple pie. It is fairly easy to make and is a big crowd pleaser. I usually make about a half dozen over the year. It's always requested for our Thanksgiving and Christmas gatherings. 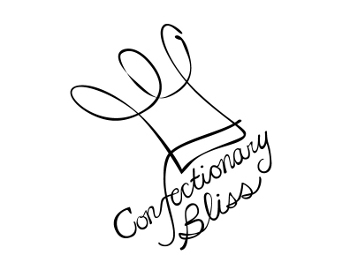 This is absolutely one of the most amazing desserts that Laurie makes. You get a great variety of texture in every bite from the light, flaky pastry crust to the syrup-soaked apples to the perfect crunch of the baked topping, all covered with sweet caramel sauce and some chopped pecans. It really doesn't get much better than this, unless maybe you add a scoop of vanilla ice cream too. 1) Sift together flour and spices. 2) Using a food processor, pastry blender or fork combine the dry sifted ingredients with the butter and shortening until the butter and shortening chunks are the size of peas. 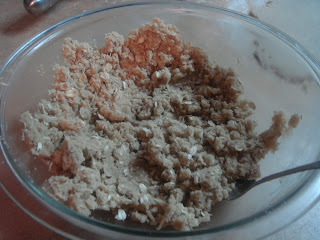 3) Slowly add cold water until the dough is just combined. Add a little at a time. Remember you can always add more but it is impossible to take away. 4) Once combined divide the dough into two balls. Take the two balls and form them into round disks (this will make it easier to roll out later if you already have them round and flat). 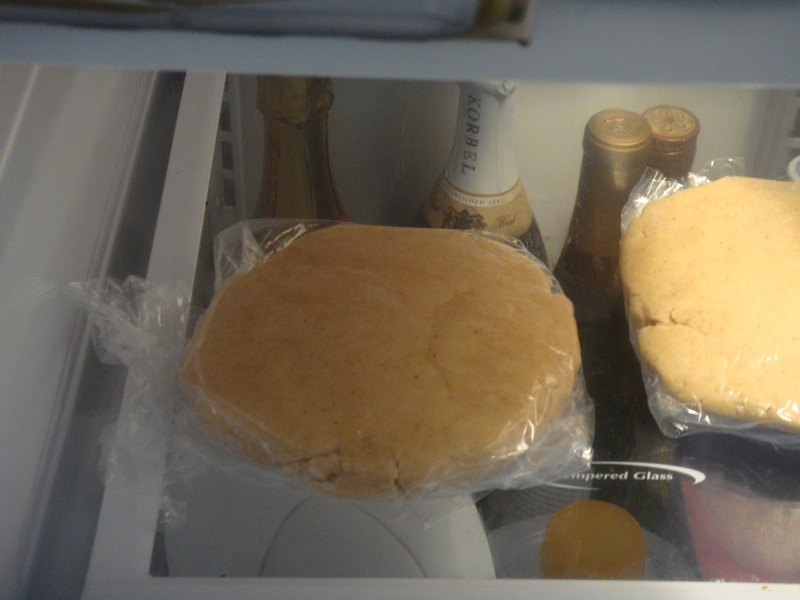 Wrap the disks in plastic wrap and place in the refrigerator for at least an hour. 5) After the hour take the dough out of the refrigerator and roll it to the desired size and thickness. 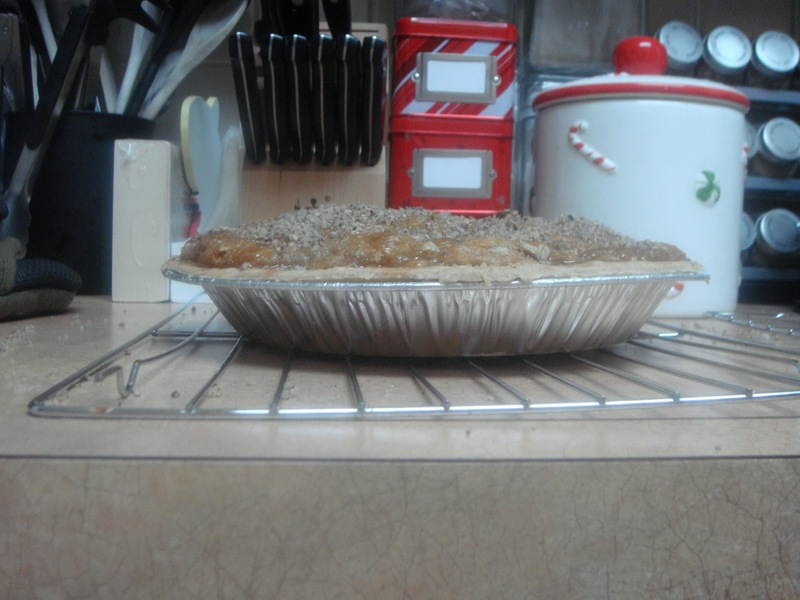 This recipe is for a 9 inch pie, but the crust will fit a 10 inch also. 6) Place the dough in the pan and refrigerate once again. There is no need to poke holes in the bottom of the dough as it is not being pre-baked. 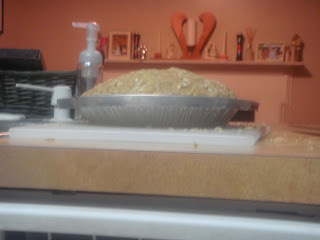 Also since there is a liquid filling the holes will just cause the crust to become soggy. One of the main things to remember when working with dough is to always keep it cold. After mixing or shaping it make sure it is cold again. This crust recipe can be used for a variety of different pies. 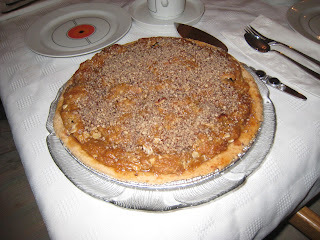 Since there is cinnamon and nutmeg in the crust, I would stick with fruit pies for this recipe. If you want to alter the recipe and remove those two spices just add a bit more flour. 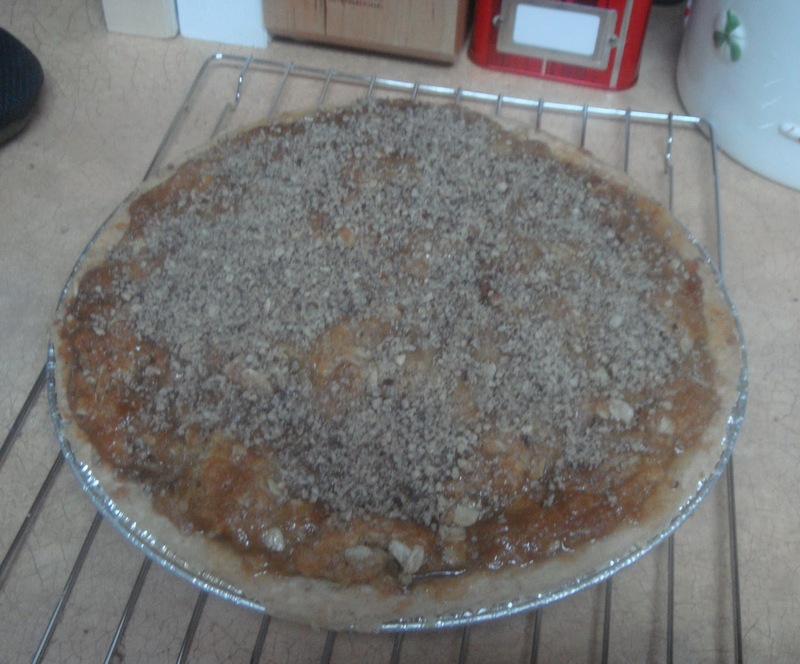 If you don't want to use the topping on this pie you can use the other crust to cover the top as you will only need one for this recipe. 1) Combine all ingredients in one bowl and use a fork to press ingredients against the side of the bowl to mix. You want everything well combined. Properly combining this topper can take a while. The smaller you cut the butter pats, the quicker it will go. 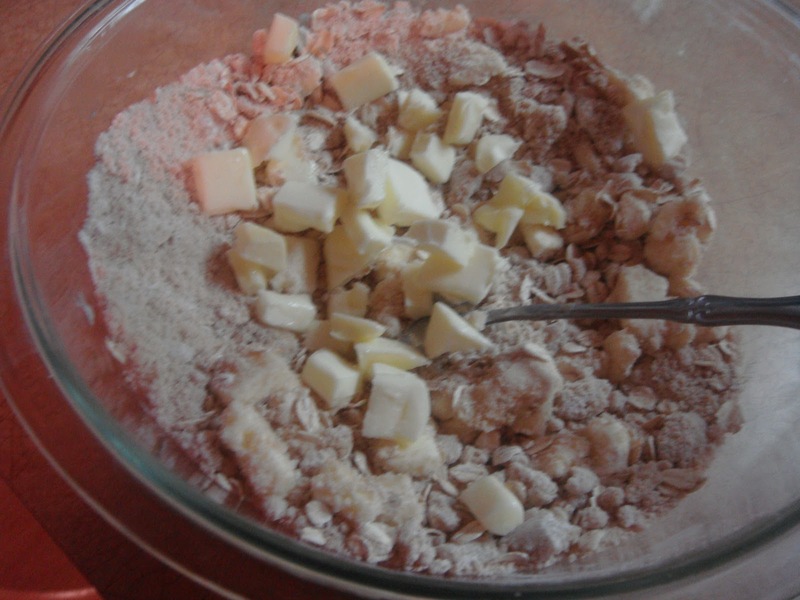 When you start, it will look something like this--pats of butter and a pile of dry ingredients. Keep mixing and pressing it against the side of the bowl with the fork until it looks something like this. It basically turns into a very thick paste consistency. 1) Preheat oven to 375F and make sure your crust is in the pan in the refrigerator. You also want the topping made and set aside. 2) Peel, core and slice apples. You want your slices to be uniform and about 1/2 inch thick. If you want your apples crispy after baking then cut them thicker and if you like them more mushy after baking then cut them thinner. Don't worry if they brown a bit because it will not matter in baking. 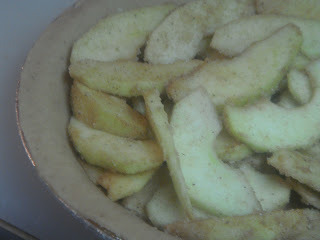 I use Granny Smith apples--the slight tartness matches well with the sugary coating. 3) Put everything but the apples in a bowl or large plastic ziploc bag (large enough to hold the apples also). 4) Combine the apples into the bowl or bag and mix well. If you used a bag, just shake until mixed. Once mixed, it should look like this. 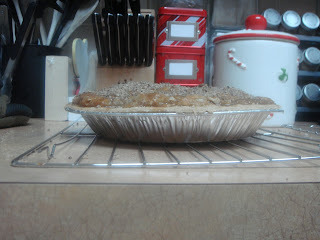 5) Place in the crust right away and top with the topping. Don't be afraid to pile the apples and topping high. They will shrink down as the pie bakes. 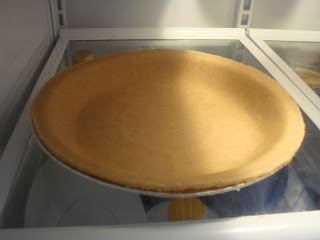 Here you can see just how high above the crust this pie will be before you bake it. 6) Cover the edges with foil and bake for 25 min. It's a really good idea to bake this pie on top of a baking sheet because if it does get too runny, you don't want the liquid seeping out of the pan and onto your oven burners. 7) Remove the foil and bake for another 25-30 mins or until the top is golden brown. 8) Remove from the oven and let cool. You can see just how much it has baked down compared to the picture above. Make sure you press down the topping on the apples and that the apples are completely covered. This will prevent the apples from burning. If you don't want the topping, you can use the 2nd pie crust on top, just make sure you cut vents in the top so the steam can get out. If you don't need a 2nd crust and will not use it for something else then cut the crust recipe in half. When Laurie makes this, we usually have a fair bit of pie dough left over and some extra apples. 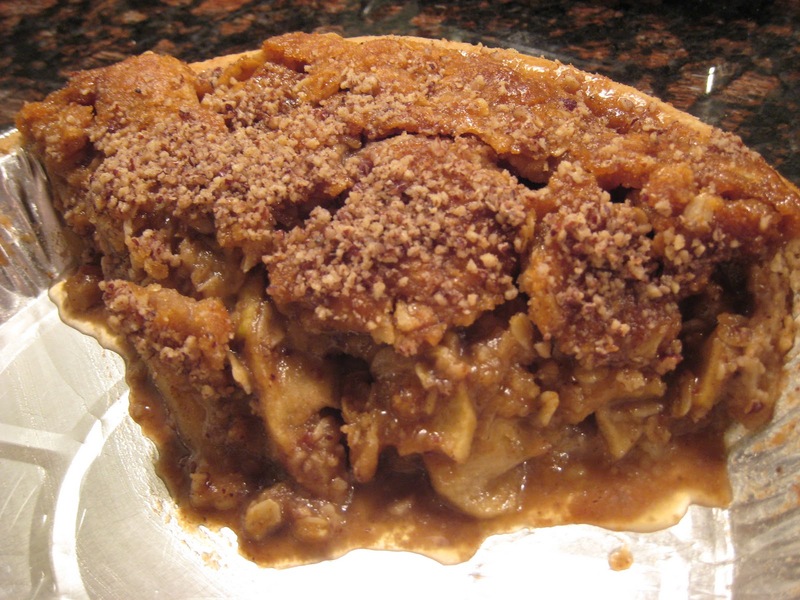 For a great quickie dessert, you can just roll the spare dough out in a circle, put the apples in the middle, and then pull up the edges around the pile of apples to make an apple pie dumpling. Just put the dumpling next to the pie on the baking sheet when it goes into the oven. While you're waiting for the pies to cool, you can snack on your dumpling. Top it with the caramel sauce and sprinkle some nuts over it and you've got a perfect sneak preview of the pie minus the topping. 1) If you combine the apples with the other filling ingredients too soon, the sugar will break down the apples and make a lot of liquid.